Grease the bottom of a 9×13 baking dish with 1 tablespoon of butter. Lay squash evenly in baking pan and sprinkle with seasoning salt. Dot with rest of butter, and bake for 15 minutes to let salt and butter bake into squash. Remove from oven and drizzle agave nectar over squash and bake another 10 – 15 minutes or until squash is tender when pierced with a fork. Remove from oven and serve. You can add 1 or 2 Tablespoons of brown sugar if you prefer. I don’t because I like the subtle taste of the squash and agave. It is just to your taste, if you or your family like it sweeter, then add the brown sugar. 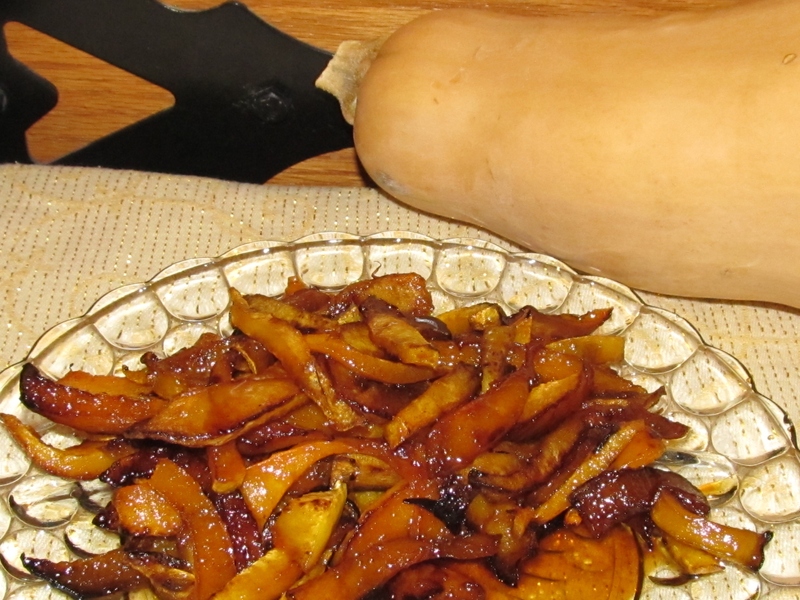 Variation: To serve for an everyday meal, pour enough oil into the skillet to fry squash until crisp, like french fries. Drain to paper towels. Salt and drizzle with agave nectar, or use nectar as a dip. You can also do this with sweet potatoes, for sweet potato fries.